If you are a 6.0L enthusiast, this is one of the most exciting developments to come along in some time, thanks to the new 6.0 Powerstroke fuel pressure regulator housing.Finally, a way to quickly and easily adjust fuel pressure to exactly where you want it in seconds! No more need for trial and error, no need to take the pressure regulator housing on and off multiple times while you experiment with blue springs, stretching springs, cutting springs, installing BB's, etc! With our diesel pressure regulator, you can tune your fuel pressure to match the requirements of your vehicle and overall package of performance modifications such as performance injectors or an aftermarket fuel pump system. Quickly tweak your fuel pressure for testing purposes, or change it for various activities - for example, you could raise the pressure for a trip to the sled pulling contest and lower it back down for the drive to the grocery store! 6.0L performance enthusiasts have long been aware that fuel pressure plays a big role in how their engine and fuel injectors perform. Pressure that is too low can very quickly damage an expensive set of injectors. While installing a blue spring is a step in the right direction, it does not guarantee an exact pressure, which will vary with pump output, injector size etc. Additionally, all springs will loose tension over time, gradually causing pressure to drop. 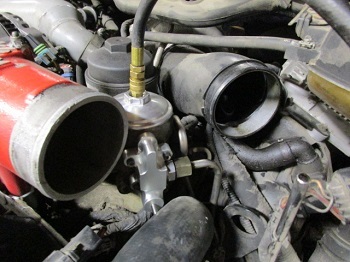 During the research phase of developing the 6.0 Powerstroke fuel pressure regulator housing, the inventor found that the trucks used in testing ran very well at 65 PSI. The 6.0 Powerstroke fuel pressure regulator housing is a work of art, CNC machined from a single piece of aluminum, and comes with a beautiful anodized finish in silver or blue to show off your modification and dress up your engine compartment. The diesel pressure regulator adjustment screw / shaft features a double o-ring seal design to prevent the possibility of any fuel leaks and is made from stainless steel to prevent corrosion. A new 'key-hole' gasket is included installed on every unit. This product is 100% designed, developed, and manufactured with pride and quality in the USA! 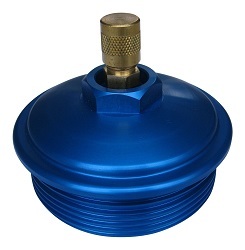 In order to provide a quick and easy way to measure your fuel pressure while you tune your system, we recommend our 6.0L Billet Aluminum Secondary Fuel Filter Cap with Schrader Valve. Please see related items below. This product is offered in both blue and silver - you can make your selection at checkout. Click HERE for complete INSTALLATION INSTRUCTIONS in PDF format. This photo above shows a silver adjustable regulator housing shown with inlet ducting removed for clarity. The AccuateDiesel billet aluminum fuel filter cap is also shown with a fuel pressure gauge connected.